Ask Galaad, he uses blender, I use 3ds max. 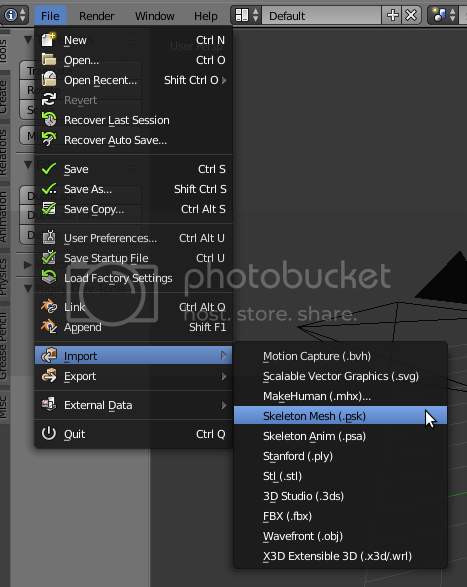 He knows how to import psk in blender. I've stopped using blender but I see I already explained how to import psk in the first page of the thread. Edited by Moritzbradtke at 19:20, 23 Apr 2017.
edit: also when i Import a mesh into blender, it has no textures, it is only the model, so when i want to edit textures with gimp and want to see how it Looks at the same time with blender, is that possible? Edited by Galaad at 19:30, 23 Apr 2017. I never encountered any errors doing this so on the spot I do not know what is your problem, I really don't have my mind into 3d software these days nor the time so I am sorry if I can not help you any further right now, although Blender has a great community and I am confident you could get some help in their forums. Yes, IIRC if you select Material in the Viewport Shading it should show the textures on your model. 3dsmax has become very expensive, unless you really intend to go pro I would not recommend, but the reg key always was and should still be 69 69696969. Edited by Moritzbradtke at 20:55, 23 Apr 2017.
thx alot galaad, that is very helpful (: how can u see textures on models when u work with 3ds max? Quick question. I'm fairly new to modding. Big fan of the heroes series though. I have been looking through some of your tutorials and the only thing I seem to be having an issue with right now is how to put my custom made heroes into the game, separate of a map. I do not want to replace heroes already in the game I just want to add them into the game. How do I go about doing this? Also thank you so much for your tutorials. What I miss in heroes 7 is a inferno. When we put our heads together we could pull the models from heroes 6 and turn them into heroes 7? Big fan of the heroes series though. What are you doing in Herp�s Kerozen 7 subform then? You need to add your new entry to H7Config.upk, it's inside the H7data folder. It's mostly the same procedure of copying the data, just be sure to have it fully loaded before you copy the insides. Hey everyone (: It's been quite quiet here... anyone still active? (: xD I would like to Change a few Sound files, in that possible, does anyone know how to do it? For example if i want to Change the victory Sound file of a specific hero, how can i do ths? 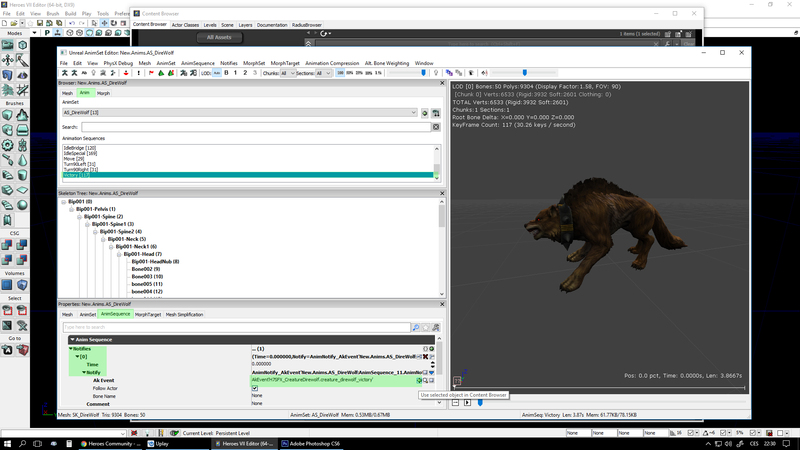 just going in the hero.upk and Input the Sound file to herosounds sadly doesnt work. Edited by lordgraa at 13:23, 14 Jul 2017.
any Chance that u could give me a few more tips? ^^' if not i will try it again later but when i open the AS_RandomSomething animset in visuals->Heros for example i cant link that much or replace, i can only open the animset Viewer, so how can i exactly Switch sounds for These animations i can check in the Viewer? or do i have to use some second Software again to split this up and Reimport it? Ofc do all this on a copy of the original AS or in a new one (core game files cannot be chnaged/modified). Edited by Moritzbradtke at 00:25, 15 Jul 2017. Edited by Moritzbradtke at 06:08, 16 Jul 2017.
and when i add hereos or spells to the game, i usually replace them but what happens when i add totally new hereos or spells to the game data? will this work? will they Show in the hero selection Screen and be shown in Magic guilds in aracne shrines on skirmish maps?